“Out upon thee, foolish boy! “Mother, I will none but her. What follows is a kind of medieval singspiel, in which verse songs alternate with prose narration. This form has been dubbed a chantefable (literally, a sing-say), and the category has been invented specifically for Aucassin and Nicolette, which is our sole surviving medieval example of what was presumably a genre. It is a delightful creation, plump with good humour and full of energy. It is a celebration of the medieval ideal of “courteous love”, and a fresh, cleansing wind blows through it. Love has captured Aucassin’s heart, and he prefers his beloved to honour, to wealth, to glory — even to the salvation of his soul. In this sense, he is the “foolish boy” his mother decries, but his devotion is so strong that it inspires him to great deeds of another sort, and to heroic virtues of another order. His love, in fact, renders him worthy to be the hero of a medieval romance. The story is packed with oddities. In one episode Aucassin finds himself at a castle where the king lies in child-bed and the queen rides forth to battle. Joining the fight, he discovers that they fight not with swords, but with crab-apples, cheeses, and mushrooms. In another, Nicolette stumbles in the forest upon a group of rustics enjoying a pastoral picnic, almost as though the Forest of Arden had been transplanted to France. The book, which is quite short, is available at the Gutenberg project. I went to Chartres on my first trip to France. It was a short train ride from Paris; I remember passing through the Versailles train station en route and caring not a whit for it; my heart was set further down that track. It was a slightly overcast day; perhaps I had hoped to see Chartres draped in an overhanging blue mantle, and so was slightly, very slightly, disappointed as I approached. I met the famous English guide, Malcolm Miller, who has been giving tours there for decades. My dominant memories are of a dimmed, vaulting interior and glory all around. One needs to be eight centuries old to know what this mass of encrusted architecture meant to its builders, and even then one must still learn to feel it. The man who wanders into the twelfth century is lost, unless he can grow prematurely young. The whole Mount still kept the grand style; it expressed the unity of Church and State, God and Man, Peace and War, Life and Death, Good and Bad; it solved the whole problem of the universe. The priest and the soldier were both at home here, in 1215 as in 1115 or in 1058; the politician was not outside of it; the sinner was welcome; the poet was made happy in his own spirit, with a sympathy, almost an affection, that suggests a habit of verse in the Abbot as well as in the architect. God reconciles all. The world is an evident, obvious, sacred harmony. was the greatest artist, as she was the greatest philosopher and musician and theologist, that ever lived on earth, except her Son, Who, at Chartres, is still an Infant under her guardianship. Her taste was infallible; her sentence eternally final. This church was built for her in this spirit of simple-minded, practical, utilitarian faith,—in this singleness of thought, exactly as a little girl sets up a doll-house for her favourite blonde doll. Unless you can go back to your dolls, you are out of place here. If you can go back to them, and get rid for one small hour of the weight of custom, you shall see Chartres in glory. The Virgin still remained and remains the most intensely and the most widely and the most personally felt, of all characters, divine or human or imaginary, that ever existed among men. Adams takes the time to inspect in detail the structure and decorative programme of the church, meditating upon the rose windows, the portals — west, north, and south — and of course the famous twelfth-century stained glass. (When reading these sections it helped greatly to consult a coffee-table book with pictures of the scenes under discussion; there are pictures in this Penguin edition, but of inadequate quality and too few.) It is clear that he thinks Chartres is the greatest architectural achievement of the time — in fact, he goes further and dubs the smaller of its two spires “the most perfect piece of architecture in the world”. Although the book’s title would lead one to believe that it is focused entirely on these two great buildings, in fact they account for only half the length of the book. Adams moves on, in the same playful and inquisitive spirit, to a consideration of the literature of the time, and to its intellectual and religious life. Among works of literature he values especially Le Roman de la Rose, Le Chanson de Roland, the songs of Adam de la Halle, and the wonderful collection of legends Les Miracles de la Vierge. Of these, I especially enjoyed his ruminations on the song of Roland, which I myself have written briefly about, but with far less success. Equally excellent is his appreciation of the religious poetry of Adam of St Victor — most of it, again, in honour of the Virgin — which he praises for its simplicity of spirit and technical excellence. Indeed, this might be a general criticism to levy against the book as a whole. It is clearly the work of an amateur (and was, in fact, originally published privately in an edition of only 100 copies, to be shared with friends). His oft-repeated, self-depreciating references to his substitution of imagination for expertise — “what we want is not dates but taste” — might be intended to defuse such criticisms. He needn’t have worried overmuch, for he was obviously a man of intelligence and sensitivity, and the lapses in judgment or errors as to fact must be relatively few. I will, say, however, that I found his prose to have a certain lugubrious quality; the same complaint put me off his other great book some years ago. Every so often I read a book that I feel I might, under different circumstances, or given more talent, have written, or tried to write, myself. This is such a book for me; not that I think I could have done it nearly so well, but I’d have liked to try. Any one can feel it who will only consent to feel like a child. Sitting here any Sunday afternoon, while the voices of the children of the maitrise are chanting in the choir,—your mind held in the grasp of the strong lines and shadows of the architecture; your eyes flooded with the autumn tones of the glass; your ears drowned with the purity of the voices; one sense reacting upon another until sensation reaches the limit of its range,—you, or any other lost soul, could, if you cared to look and listen, feel a sense beyond the human ready to reveal a sense divine that would make that world once more intelligible, and would bring the Virgin to life again, in all the depths of feeling which she shows here,—in lines, vaults, chapels, colours, legends, chants,— more eloquent than the prayer-book, and more beautiful than the autumn sunlight; and any one willing to try could feel it like the child, reading new thought without end into the art he has studied a hundred times; but what is still more convincing, he could, at will, in an instant, shatter the whole art by calling into it a single motive of his own. The architects of the twelfth and thirteenth centuries took the Church and the universe for truths, and tried to express them in a structure which should be final. Knowing by an enormous experience precisely where the strains were to come, they enlarged their scale to the utmost point of material endurance, lightening the load and distributing the burden until the gutters and gargoyles that seem mere ornament, and the grotesques that seem rude absurdities, all do work either for the arch or for the eye; and every inch of material, up and down, from crypt to vault, from man to God, from the universe to the atom, had its task, giving support where support was needed, or weight where concentration was felt, but always with the condition of showing conspicuously to the eye the great lines which led to unity and the curves which controlled divergence; so that, from the cross on the fleche and the keystone of the vault, down through the ribbed nervures, the columns, the windows, to the foundation of the flying buttresses far beyond the walls, one idea controlled every line. An economic civilization troubles itself about the universe much as a hive of honey-bees troubles about the ocean, only as a region to be avoided. The hive of Saint Thomas sheltered God and man, mind and matter, the universe and the atom, the one and the multiple, within the walls of an harmonious home. The nineteenth century moved fast and furious, so that one who moved in it felt sometimes giddy, watching it spin; but the eleventh moved faster and more furiously still. The Norman conquest of England was an immense effort, and its consequences were far-reaching, but the first crusade was altogether the most interesting event in European history. Never has the Western world shown anything like the energy and unity with which she then flung herself on the East, and for the moment made the East recoil. Barring her family quarrels, Europe was a unity then, in thought, will, and object. Christianity was the unit. Mont-Saint-Michel and Byzantium were near each other. The Emperor Constantine and the Emperor Charlemagne were figured as allies and friends in the popular legend. The East was the common enemy, always superior in wealth and numbers, frequently in energy, and sometimes in thought and art. The outburst of the first crusade was splendid even in a military sense, but it was great beyond comparison in its reflection in architecture, ornament, poetry, colour, religion, and philosophy. Its men were astonishing, and its women were worth all the rest. This is a poem that I love, and, in addition to a Middle English version, I’ve a few different translations in my collection, most notably that of Tolkien. Arguably one doesn’t need, and shouldn’t want, a translation, the original being adequately accessible to any reader willing to put in a little elbow grease, but I heard good things about this translation by Simon Armitage, and sometimes one just doesn’t have any elbow grease ready at hand. The first line has three stresses in the pattern aaa, but the second has two pairs in the pattern abba, and the third again has two pairs but in the pattern abab. Occasionally, as I said, he hits all four stresses with the same sound (“trussing and trying all the trammel and tack” (l.1129)), but these are exceptional. Alliterative poetry is wonderful to read aloud, and I read this aloud to myself as much as I could — or as much as my saintly wife would tolerate in the wee hours while she was trying to sleep. Sometimes the ear picks up the stresses not evident to the eye, as in a line like: “A man quite capable, it occurred to Gawain” (l.848). and flung it in fury at the man in front. ‘My downfall and undoing, let the devil take it. the fidelity and kindness which every knight knows. through treachery and untruth I have totally failed, said Gawain. and I shall bear the blame. I found that I grew very fond of these little envoi as I read; they provided a punchy variation in the rhythm that kept me interested. “I’ll kneel, bare my neck and take the first knock. The point is arguable; the Green Knight is a lively, uncouth character who might, I grant, speak in this way, if only to ruffle Arthurian feathers. Armitage has also translated the same poet’s magnificent poem Pearl, and I’m curious about it. It is one of the most technically virtuosic poems in the English tradition, and I’m wondering how Armitage grapples with those challenges. Perhaps I’ll read it — in a year and a day. In the world of early music, where manuscripts are often bereft of temporal markings, dynamic markings, and even pitch indications, a certain amount of creative interpretation is an inescapable part of any performance. But there’s interpretation and interpretation: sometimes musicians come along with a bold challenge to the received wisdom about how the music of a particular time and place should sound. Case in point: Graindelavoix give us a version of Machaut’s Messe de Nostre Dame that is frankly bizarre: pitches slide all over the place, the timbre is rough and unpolished, and ornamentation, inspired, it sounds, by Middle Eastern and Arabic singing, pervades all. This embedded video contains a full performance of the Mass, with propers, but I’m queuing it up to the Gloria, which lasts for about 6 minutes. I’m mostly thrilled by the bass in this ensemble, who is some kind of monster: listen, for example, to the notes he sings at “Jesu Christe” (about 2-1/2 minutes in, and again at about 4 minutes in). Amazing. I’m honestly not sure if I like what they’re doing — it comes close to being an early-music freak-show — but I do like that they emphasize how little we really know about how this music sounded to those who first wrote and performed it. And I definitely like that bass. If you don’t know how this Mass usually sounds, here is a fairly typical reading of the same section. This autobiography, the earliest in English, was dictated to scribes (for Margery could neither read nor write) in the first decades of the fifteenth century. 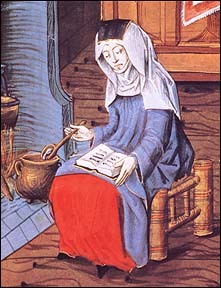 In it, Margery describes her spiritual life and her travels, and gives portraits of English life at the time. Her writing has about it that same refreshing candidness and lack of pretension that I found in the writing of Julian of Norwich (whom Margery met on at least one occasion). She refers to herself as “that creature” much of the time, and is as matter-of-fact about the storms of her soul and the voices she hears as she is about weather and the hazards of travel. Much of the book is devoted to Margery’s descriptions of her remarkably vivid spiritual experience. She reports having spoken with numerous saints — sometimes St Peter, sometimes St Paul, sometimes St Katherine or some other — with Our Lady, with Our Lord himself, and even with the Holy Trinity. She had an especially strong devotion to Christ’s Passion, and is regularly reduced to tears at the very thought of his suffering. Indeed, these plentiful tears, which she took as a special gift from God (“tears with love are the greatest gift that God may give on earth”), were also a recurring source of tension in Margery’s social circles, and I came to feel a certain affection for them. Again and again she describes how she was overcome with grief and cried out in great sorrow, with copious tears, abundant tears, astonishing tears, unquenchable tears, while those around her gazed with incomprehension or derided with scorn. “Some said it was a wicked spirit tormented her; some said it was an illness; some said she had drunk too much wine; some cursed her; some wished she was in the harbour; some wished she was on the sea in a bottomless boat; and so each man as he thought.” Margery was aware of the disdain, but, it seems, she remained grateful, for her tears “never came without surpassingly great sweetness of devotion and high contemplation”. For me, among the most interesting parts of the book were those that described her travels. She made several pilgrimages, including journeys to Santiago, Jerusalem, and Rome. Late in life she volunteered to accompany a young widow from England to Germany. Her accounts are of great interest, partly for their details about the uncertainties of travel at that time, and partly for the descriptions of the places she went and the people she met. The Book of Margery Kempe is not an immortal classic. It owes at least part of its fame to the mere fact of its survival (in a single manuscript, I note, which can be viewed online courtesy the British Library). I said above that Margery described her spiritual life in the down-to-earth manner in which one discusses the weather, and, as with descriptions of weather, a little goes a long way. But it was genuinely fascinating to read of her travels, to imagine her visiting places that I myself have visited, and to learn, through her, something of the attitudes and character of her contemporaries. The Germanic tradition of stories about the Nibelungs was familiar to me only through Wagner, but for some time I had wished to acquaint myself with the medieval roots of the legendarium, and at long last I arrived at this Song of the Nibelungs, which is one of the chief glories of that tradition. It was written by we know not whom, and we know not when (but probably around the year 1200). I first noticed that although the story shares a number of characters with Wagner’s version — Sifried, Brunhild, Hagen, and Gunter, principally — the story as a whole bears no resemblance to Wagner’s, not even in the sections about those shared characters. But in adapting the story for his own purposes Wagner seems to have been in good company, for there is a rich and complex manuscript tradition testifying to the malleability and creativity with which medieval culture treated these tales. The translator, Burton Raffel, does not explain why it was this version of the story which he chose to translate, and I rather wish he had. The basic arc of the story concerns two royal marriages which, poisoned by jealous pride and suspicion, erupt into violence that eventually leads to the downfall of all. Surprisingly (for those coming to the story from Wagner) there are no gods in the cast, and, although there are cursory references to Christianity here and there — the characters hear Mass in the morning, for instance — the poem as a whole shows little interest in religion, and is far from pious in spirit. There are a few magical elements around the edges, as when one character hears a prophecy from fountain sprites, but otherwise the tale is grounded in the political and interpersonal world of its characters. I almost wrote that it is grounded in “realism”, but that would not be quite right. The knights at the center of this story — Sifried, Volker, Gunter, Hagen, Rudigor, and a few others — are heroes of legend, which means they fight with superhuman strength, slaying dozens or hundreds of adversaries with ease. The women are surpassingly beautiful. Everyone is impossibly polite: indeed, a significant part of the poem is devoted to the niceties of courtly etiquette, with page after page devoted to the elaborate ceremonies of court: gift-giving, welcomes, and feasts. The author seems to relish the intricacy and formality of these encounters, and the reader — the happy reader, at any rate — will relish them too. ready to welcome those their king had invited, who would try to destroy him. rolling. The dead men’s families wept and cried, and wrung their hands. It is worth noting that Giselher and Hagen are not the villains of the piece, but instead something like its heroes. In fact it’s not so easy to say just who the heroes are: everyone has faults, and everyone pays for those faults in the end. To my mind Sifried comes closest to being an unequivocal hero, but (***spoiler alert***) he is killed off in the early going, the victim of jealousy born of misunderstanding. His wife Krimhild is the wronged party who seeks revenge, which might, on a warrior’s code, be the honourable course, but she too is vindictive beyond measure. The poem is morally complex. The original poem is written in quatrains consisting of rhyming couplets: AABB. Each line is divided into two halves, with each half-line having three (or, in the case of the last half-line of each quatrain, three or four) stresses. Raffel has tried to preserve this structure in his translation, but inevitably compromises were necessary. He has strictly preserved the metrical scheme, as is evident from the passages cited above. He claims to have usually preserved rhyme as well, but to my ear the rhymes are often only approximate, and as I read I was almost never aware of them. their deeds were nothing at all compared to noble Sifried’s might. to me, and I wish it did. Perhaps this can help me explain. That rhymes at least we well as one of Raffel’s typical stanzas, and it has the right stress pattern, but I’d not call it poetry. My dear Krimhild, now we need to return to my land. It’s time. In the third line “here” gets a stress, emphasizing that where they are is the problem, and in the fourth line “now” gets a stress, emphasizing the need for immediate action. Were that stanza smeared out into prose, I’m not sure I’d read it in quite the same way. Despite the difficulties I had with the translation, we English speakers do not have many means by which to get to know this poem, and I am grateful for Raffel’s labours. 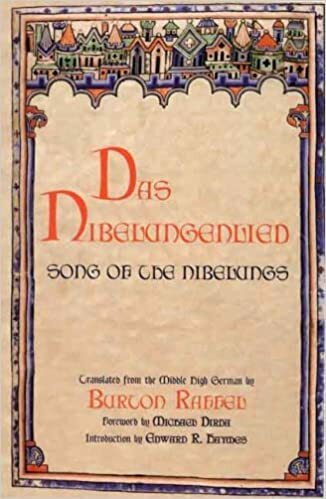 Das Nibelungenlied is a great poem, one especially bracing for readers from our culture, for in it we encounter a world quite other than our own, where honour and strength are the leading virtues, and in which courtesy and violence are engaged in a high-stakes contest of wits. It has a cast of characters that is memorable in action and manageable in size, and strong dramatic instincts. In the sweepstakes of medieval Germanic poetry it doesn’t displace Beowulf in my affections, but I did certainly enjoy reading it. Over the years I’ve dabbled in medieval literature, enjoying Chaucer and Dante, Chretien de Troyes and Beowulf. Naturally, some works have been more challenging than others, and for a variety of reasons: themes, structure, language. Piers Plowman is as difficult as anything I’ve come across, and then some. I’m tempted to say that there is nothing simple about it. The work is an allegorical drama in which the main character, Will, wanders through the world populated with a variety of characters — Conscience, Truth, Scripture, all seven of the Deadly Sins, Reason, and so forth — on a journey to discover Do-Well, Do-Better, and Do-Best. The characters offer Will advice, upbraid him, and encourage him on his moral quest, rather like a medieval Pilgrim’s Progress. The story is complicated by a series of dream-visions, and even dreams-within-dreams, that add layers of interpretive difficulty to a book already beset with vexatious challenges. To seek out Saint James · and saints in Rome. And had leave to lie · all their lives after. More than to tell the truth — such talk was theirs. Went off to Walsingham · with their wenches behind them. And behaved as they were hermits · to have an easy life. It’s wordier (as modern English usually is in comparison to Old or Middle), but certainly much easier to follow. Langland’s style in Piers Plowman is quite unusual. Though this might seem a wild comparison, as I read I kept thinking of Dostoyevsky, not for his interests or his genre (naturally) but just for that unhinged quality, as though the characters are a little wild-eyed, prone to do or say anything. Langland jumps from one thing to the next. He salts his poem liberally with Latin phrases, fragments of Scripture, and quotations from antiquity. He is going somewhere, but unsteadily, with numerous rapid detours. The language is thorny and angular. I haven’t said anything yet about Piers Plowman, the title character. Will meets him at several points in the poem, always, I believe, in a dream. At various points Will meets him riding into Jerusalem, or in the guise of the Good Samaritan, or offering a pardon for sins. Will speculates that he is Christ in disguise, and, given his characteristics, this seems reasonable to me. Commentators on Piers Plowman stress its moral seriousness and its satiric edge. Of the former there is ample evidence, for the poem contains many scathing criticisms of Church and society in his day, but of the latter I confess I was able to detect but little. Satire is a tonal matter much of the time, and that’s hard to convey in a translation and hard to detect in an unfamiliar dialect. In the end, I am pleased to have read the poem, though I confess I did not greatly enjoy it. It is one of those hurdles that anyone wanting an education in medieval literature will have to clear, and it feels good to have cleared it (more or less! ), but, unlike Chaucer or Dante or the Gawain poet, I doubt I’ll return to it for pleasure.